It’s an exercise in stating the bleedin’ obvious to say that a computer is an integral part of most photographers’ equipment, unless perhaps you’re Bill Eggleston, though it’s possible even he uses one now, I don’t know. Bill? Billy? If you happen to be reading this, why not drop me a comment at the end of this article to let me know. That’s if you have a computer with which to read this post of course. Back to the plot, I certainly do have a computer. In fact I have a relatively prehistoric Apple MacBook Pro which must be getting on for four years old (that’s 50,000 computer years, 1.3 trillion if it’s a PC) and I was starting to worry it wasn’t up to the task any more. Over the time I’ve had this computer I’ve asked ever more of it. The files from my cameras have doubled in size, I’ve upgraded to Lightroom 4 and PhotoMechanic 5 on top of all the regular software anyone uses when they have a computer and I’d become increasingly aware of the fan noise that would start up whenever I worked on images. Lightroom in particular seemed to get the fans working hard. Sometimes it was as if there was a DC10 on my desk getting ready for takeoff, and I had been wondering if some harm was coming to the processor, which is what the fans are there to cool. I say fans, there are two in my machine, and a nifty piece of software called Fan Control tells me what the temperature of my processor is in ºC, what speed each fan is doing in RPM and I can adjust various settings to dictate when the fans kick in and what temperature they’re trying to maintain. 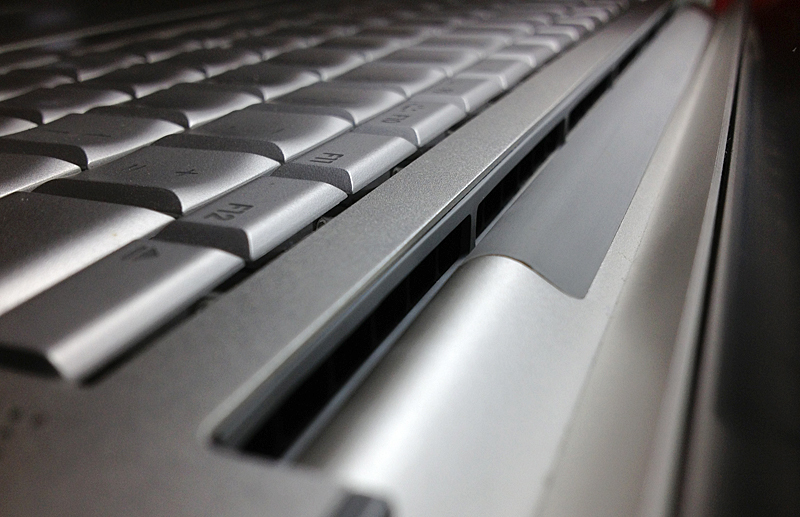 When you open an older MacBook Pro, the hinging movement of the screen reveals a long slot along the back (see photo) and this slot is the air intake which the fans use to draw in cold air and expel the heat. So I got my vacuum cleaner with a brush attachment and gave the slot a good clean out. What a revelation! Where my laptop would routinely be running hot on even basic tasks like writing a blog, it is now silent. Running Lightroom still causes the fans to kick in, but instead of around 85 ºC, the processor runs at anything up to 20 ºC cooler. The laptop doesn’t run any faster, but it’s quieter, cooler and will be using less power. Plus the processor and other gubbins are less likely to fry and I’m less likely to be hit in the head with the shrapnel of an exploding fan. That really would be a disappointing way to die.